Here, if I put the coconut tartlets in these cupcake liners, will they look like they came from a bakery? When Marija of Palachinka, host of the Weekend Wokking eggplant round-up, chose coconut for the October challenge, I knew this recipe no longer had an excuse to sit in the queue. Back in January, one of my college friends was in town. 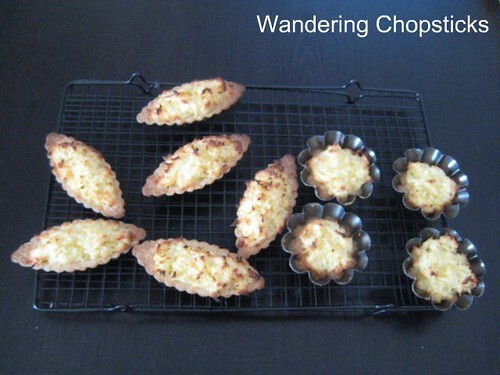 Funnily enough, I was flipping through The Best of Nicole Routhier when I saw her recipe for banh dua nuong (Vietnamese coconut tartlets). I didn't bother with her recipe, I knew I wanted to try using my basic Shortbread Cookie dough as the basis for the tart crust and then winged the coconut topping. My friend loves coconut, so that gave me a good excuse to finally try this recipe. My friend loved them and ate one right away. Since I packaged them in my cute little box from Kiki Bakery - Alhambra, she even thought they came from a bakery. If you let the butter soften ahead of time, the whole recipe came together in less than an hour. 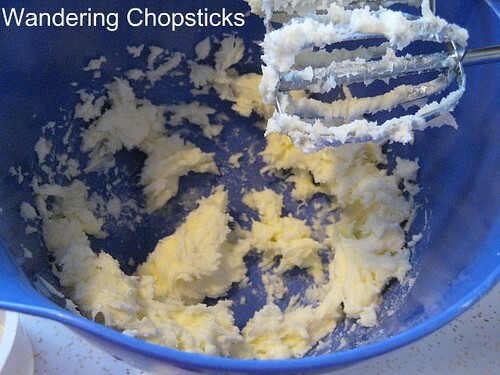 Leave the butter out at room temperature until softened. 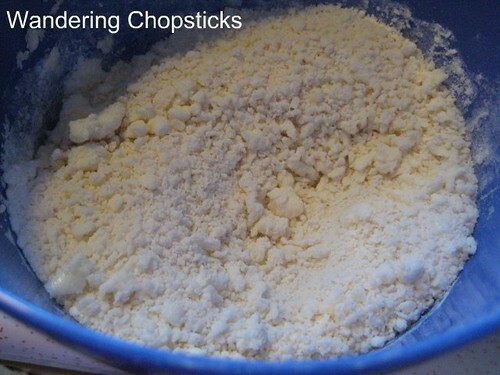 Beat 1/4 cup sugar and 1 tsp vanilla extract into the butter until creamy. Add in 1 cup flour and mix thoroughly. The mixture will be very loose and powdery. Then, by hand, knead the flour in the bowl until it comes together. You can also dump this out on a table and do it, but I prefer to dirty as few things as possible. No dishwasher you see. Anyway, this should take just a few minutes until it looks like so. Press into greased tartlet molds. 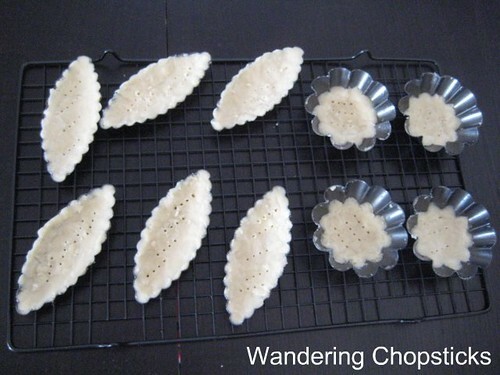 Remember to indent the centers a bit so they can hold the filling. Prick with a fork. Bake at 325 degrees for about 15 to 20 minutes. While the shortbread crust is baking, it's time to prepare the coconut topping. Using the same bowl (so you don't have to wash any additional dishes), add 1 cup unsweetened coconut flakes, 1/3 cup sugar, 1/3 cup flour, 1 egg, and 1 tsp baking powder. Set aside. Now let's check on that shortbread shall we? Nice slightly golden crust. You don't want it too brown. Remove the pans from the oven and crank the temperature up to 375 degrees. 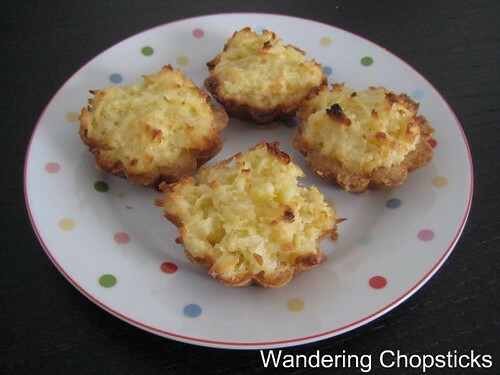 Put the coconut mixture on top and bake again for about 10 to 15 minutes or until coconut flakes turn brown. 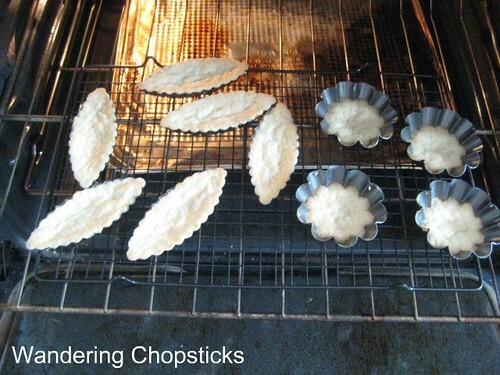 The shortbread crust is light and slightly crumbling. 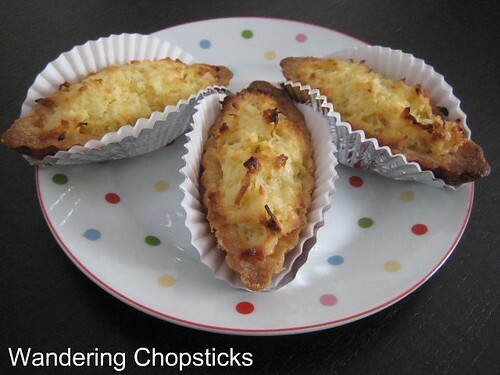 The coconut filling is slightly moist and chewy. Here's the round versions I made using brioche molds. This photo is for Elmo of Monster Munching, who liked my toe socks photo last winter. My college friend thinks I have cute feet. Upon first meeting her brother years ago, he looked down at my feet and chuckled. What's so funny? Apparently she had told her brother about my feet. So I wore the leprecaun socks I bought as a souvenir from my weekend trip to Dublin, Ireland just so I could show her my feet again. 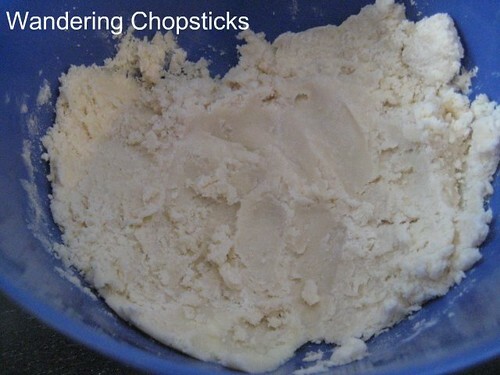 I'm submitting this recipe to Weekend Wokking, a world-wide food blogging event created by Wandering Chopsticks to celebrate the multiple ways we can cook one ingredient. This month's secret ingredient is the COCONUT. The host for October is Ivy of Precious Pea. 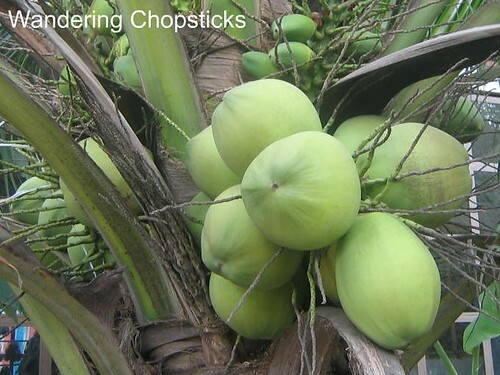 Check her blog for the coconut round-up, with 14 fabulous coconut recipes. If you'd like to participate or to see the secret ingredient, check who's hosting next month. 1 year ago today, lavender biscuits. They look so good! I love sweet coconut things. I love that you made something sweet for the event! Yes, they do look, as my nephew says, "realer," like from a bakery. 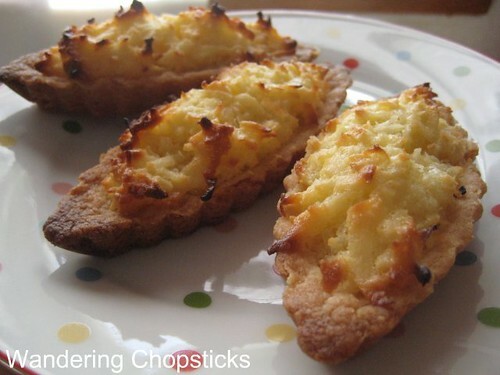 I love how the coconut mounds up like that and those crispy peaks look to die for. The socks are too cute! Well, I'll just have to show you my feet some more so you can see just how cute they really are. ;) The needlework is actually the cover of a footstool that I bought on sale at Target. HAHAHAHA! 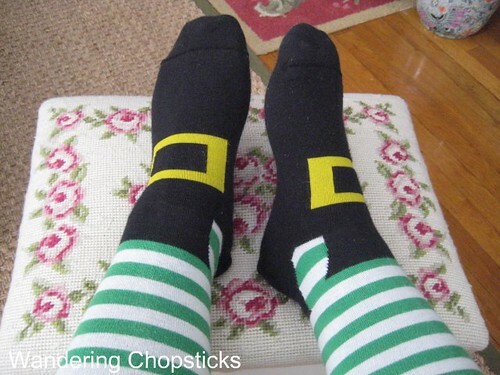 cool socks! can i borrow them for halloween?? =P jk. the cookies look really good, too.. 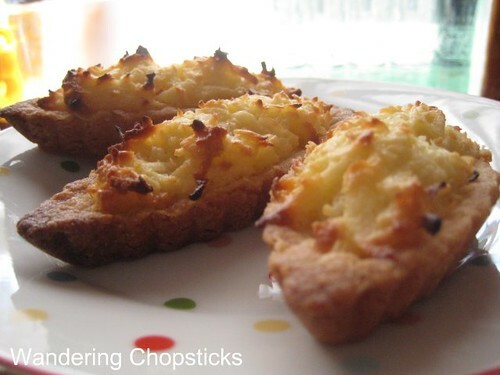 I have all the ingredients to make these! woohoo!